CEEP will be present at PLASA 2013 and are happy to meet up with anyone wishing to speak to us. Please contact us at sales@ceep.co.uk to arrange a meeting. PLASA London is the world’s premier pro audio and entertainment lighting event, held annually at ExCeL London. Founded by PLASA in 1977, PLASA London has been a driving force in supporting R&D and the development and promotion of the professional entertainment technology industry for over 35 years. 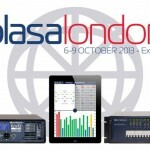 In addition to hosting exciting launches by the world’s greatest designers and engineers, PLASA’s worldwide reputation – earned over the last 35 years – for attracting the most creative practitioners in the business has made PLASA London the must attend event for international networking at the highest level. Posted September 4, 2013 .